You can access American Airlines here. Eligible members have been given upgrade instruments that can be used for eligible flights. The eligible flights must be both marketed and operated by American Airlines, British Airways, Finnair, Iberia and Japan Airlines. Note that there can be higher or lower personalized offers. Targeted AAdvantage members have four months to meet these targets to keep the status through early 2020. American Airlines has done similar offers yearly in the past and often more than once. Members get the status upfront and then need to reach the miles and dollar requirements by the set deadline. It is good way for American Airlines to get potential fliers to “test” their elite program. If you were targeted for this offer, remember that you need to fulfill the full status requirements by the end of this year to keep it through 2021. The T&Cs are bit unclear when it comes to the operating airline part. The fact that it states “Flights marketed and/or operated by codeshare partners not listed above aren’t eligible for this promotion” means that the JV partner ones are eligible (they have always been for these status promotions). This is an exclusive offer only for members who received a message directly from American Airlines. You must register by 11:59 p.m. CT January 25, 2019, and prior to travel in order for your Elite Qualifying Miles (EQMs) and Elite Qualifying Dollars (EQDs) to count toward this promotion. You can only participate in 1 elite status challenge at a time. 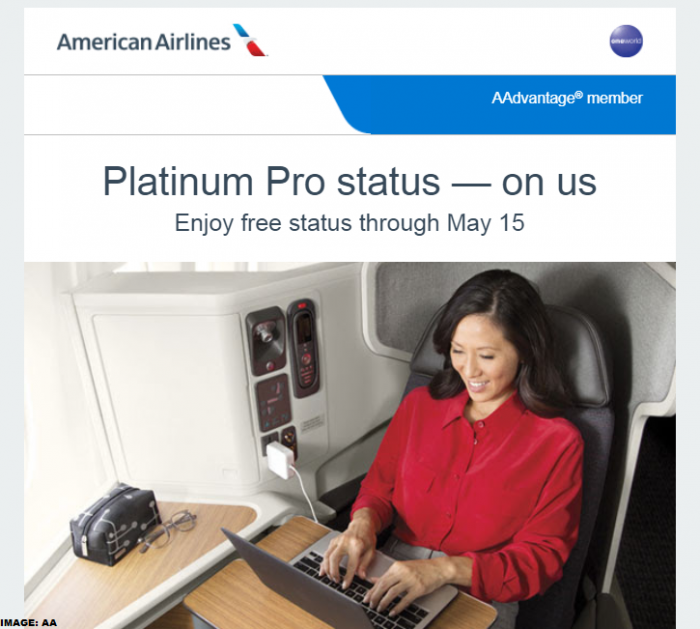 AAdvantage Platinum Pro status received through this offer is valid through May 15, 2019, and will be reflected in your account within 24 hours of registering for this promotion. Travel completed before registration doesn’t count toward this challenge. Eligible tickets include purchased, published fares flown between the date you register and May 15, 2019. Qualifying, eligible flights must be operated by American Airlines or marketed by American Airlines, American Eagle service, British Airways, Finnair, Iberia and Japan Airlines. Flights marketed and/or operated by codeshare partners not listed above aren’t eligible for this promotion. Bonus EQDs and EQMs don’t count toward this offer. After you reach the required thresholds, your elite-status membership benefits will be extended immediately through January 31, 2020. You must requalify for AAdvantage elite status membership annually.